Latest Finds II | Vault Of Evil: Brit Horror Pulp Plus! I seem to remember The Enigma Files being a cerebral less histrionic forebear of Waking The Dead. The author note on Jack Gerson is interesting in that it makes mention of him just completing work on a new three part serial called The Assassination Run. I recall that being an excellent thriller about a former hitman and his wife being hunted out in the Med. I believe it starred the virile and under-appreciated actor Malcolm Stoddard and the lovely and lamented Mary Tamm. There was later a sequel to it called The Treachery Game. Excellent finds! I saw The Omega Factor around 10 or 12 years ago on VHS copies a friend shared with me. I passed them on to a friend, but seeing your book made me think I'd enjoy revisiting the series. And it's all on youtube now. According to the Wikipedia entry for the series, the book was a new story except for the first bit which was a novelization of the first episode. And now there is a Big Finish radio version featuring Louise Jameson. A new story for this is set to be released this year. It's set in the 2010s. Thanks for the additional info H. I don't think I had appreciated that TOF was essentially an original novel as opposed to a mere transcribe of scripts as so many tv tie in books of the period were. Makes me all the keener to read it now. I sometimes wonder exactly why The X-Files ever caught on in quite the way it did when, as TOF demonstrates, even in television terms it was fellwalking across some pretty long established landscapes. Not that it wasn't a fun and glossy watch, mind. The point has to be made of course that TOF was produced by George Gallacio who went on to produce Bergerac. The Curse strikes again. Aaiieee!!!! The Curse!!!! 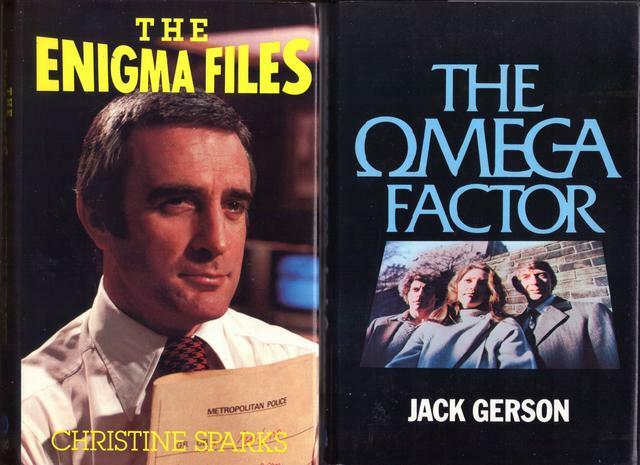 I would heartily recommend The Enigma Files - Christina Sparks was a journo at the time, and started on the humble tie-in (she did two volumes of The Good Life amongst others that were rather fun) before forging a very successful career as a romantic novelist. In The Enigma Files she concentrates on the backstories of the characters and the arc of how Tom Addams' hero (God, he was an underrated actor - carpet ads and all!) came to be sidelined in a cold case office. It's adaptations of the episodes, but the way she tackles it stops it being to episodic and builds it as a through narrative so that it has a satisfying flow.I picked it up a couple of years back as I remembered the series fondly and was not disappointed. I thought of it as an update of Roy Vickers' Department Of Dead Ends stories, but that probably says more about what I read than anything else. I had a copy of it years before, along with The Omega Files, but both remained unread and culled about three housemoves and two decades ago. I'd regretted that at some point, so finding The Enigma Files was satisfying in a way that I can't help feeling was a little pathetic. Anyway, I say that just to move smoothly onto your point about the X-Files, of which I saw The Omega Files as one of many fore-runners. I think the success of the X-Files is easily explained: although it's a subject that is usually little more than cult fodder in mainstream terms, Chris Carter lucked out when he cast Duchovny and Anderson - it was their chemistry that I think was unpredictable and the X factor (ha! see what I did there??) and took the show beyond just a sci-fi/horror audience. Yes, it was well done in the first few seasons (the overall arc became too much for me after a while), but so are a lot of other shows. It's noticeable that it started to die when Duchovny opted out, and that the revival has reached a season two despite being a piss-poor retread of the old tropes. Dave & Gill have still got it. Compare that to Fringe, which is a show I discovered last year via a charity shop dvd, and ended up buying all the seasons on ebay. It has many of the same tropes as the X-Files (and others), and for me is much better in terms of the characters and plotting. Yet it never broke in the same way, and I think this is entirely down to that fact that the Mulder'n'Scully of Fringe - actors Joshua Jackson and Anna Torv - despite being excellent don't have that same chemistry, which is in part due to the backstory of Torv's character, which means that she is of necessity cold and aloof until near the end of season two - by the time the chemistry can get going, you're firmly in a cult audience with no way back... It's a shame, as they really do turn it on in seasons 3&4, by which time only the geeks are watching (and yes, I know that means me). Mary Whitehouse! God, she was a pain - and yet, she was ballsachingly sincere and well-meaning in her own blinkered way. Laurence James was editor on the autobiography she published via NEL and expected to dislike her intensely when he met her. To his bemusement, he actually quite liked her as she was naivley sincere and really wanted to do good - she just had a view totally at odds with where the world was headed, and was convinced it was wrong. A caricature of her turned up on the last series of Endeavour (set in the sixties and the early years of Inspector Morse, for those who have not had it aired yet in their part of the world) as a righteous prig who faked a series of poison pen death threats to get publicity for her cause. It's how she is perceived these days, but only the righteous prig bit is correct - she was not seeking publicity for herself all the time, no matter how it seemed. She just - sadly - was convinced that someone needed to save the world from itself. Thanks for the recommendation for the Enigma Files book and series, Pulp Hack. I've never heard of the series but I always enjoy Tom Addams whenever he shows up. My favorite performance of his is in a Linda Thorson era Avengers story called, I believe, "Take-over." It was directed by Bob Fuest and performed and photographed in a very artful, mannered style that is almost like an encapsulation of several late Sixties tropes and fetishes. Memorable work. Addams had a beautiful voice and a very vivid onscreen presence. I am not aware of the carpet ads as I live in the US. They are probably on Youtube now. Also completely unacquainted with the work of S. Horler. It definitely sounds pulpy. I barely saw any of the X files was surprised when G. Anderson agreed to do the new version (which I haven't followed at all--I switched off the TV for good several years ago, not out of any sense of clambering to higher moral ground, but just because the thing had gotten to the point where I simply could not be arsed with any of it any longer). In the episodes I did see, the chemistry between Anderson and Duchovny did indeed seem to be the key point of appeal. A co-worker loaned me videotapes of a few episodes that had "cult" type themes, including one where they investigated a town of vampires and another one where someone built a Frankenstein monster who turned out to be a Cher fan. Of course I could be hallucinating that particular memory... it's hard to say at this point in the scheme of things. Duchovny's career mostly seemed to go nowhere fast after the original X gig wound up, but again, I live in a cave so for all I know, they still worship him in Peoria. Heavens to Murgatroyd Pulphack, the things you know never cease to amaze and delight. I've only been able to read the first chapter of THE ENIGMA FILES so far but agree with you that the calibre of the writing is several notches up on the Terrance Dicks approach to novelising scripts. I do harbour fond recollections of this show and it is surely an indictment of the changing ethos at work in television circles that it only lasted one series while the inferior and derivative New Tricks was run into the ground over the course of a decade. More on that point in a minute. I guess my own explanation for the success of The X-Files would be much the same as yours. It certainly did owe a lot to the screen presence and chemistry between the leads: even if both Duchovny and Anderson have all the vocal expressiveness of a pair of bronchitic kookaburras: Duchovny's voice especially is pure phonic Mogadon and could probably sedate a charging water buffalo at fifty paces. (Apropos of nothing in particular: am I the only one who found it surreal that the BBC found it necessary to subtitle its recent interview with Lester Piggott? Not only was it insulting but somewhat rich considering that most BBC flagship dramas are mumbleathons and no one feels inclined to caption them). Anyway, The X-Files was helped too by its emotive Canadian locations: (it certainly lost something when production was transferred to LA at Duchovny's insistence, who showed his appreciation by buggering off shortly afterwards). And there was certainly a consistent inventiveness and quality to the scripts, particularly those contributed by Darin Morgan: (although I seem to recall that he was responsible for the one set in the circus which shamelessly pillaged Whitehead's "Cassius"). Even with DD on board though I still think The X-Files went on at least a year too long. American tv networks aren't always as brutal and unforgiving as their reputation suggests. If they were then there is no way Smallville could ever have limped into a second decade. But perhaps things are changing now which is why so many new shows seem to take out insurance policies against cancellation by having in built enfranchisement incorporated into their premises. Over here we used to be wholly unsentimental about culling shows, however popular they might once have been, when it was deemed that they were past their sell by date. But, of course, back then tv was controlled by true visionaries like Lew Grade and Bill Cotton who were always on the lookout for anything new, fresh and exciting and had an enviable record of finding it. Things began to change in the mid 80s, first with the ill advised ressucitation of the terminal Dr Who and then by shows like Minder and even the hallowed Inspector Morse going on far too long because executives had lost confidence in being able to find substitutes for them. And now, because there is no confidence in innovation, the law of diminishing returns prevails. It is surely only a matter of time before even the current flavour of the month Line of Duty is being derided for being not half so good as it once was but persevered with nonetheless. Its now the norm for even moderately successful shows and formats to be sucked dry like coccooned bluebottles: Death in Paradise being a pertinent case in point. Things aren't helped by the fact that all new shows are commissioned by committes of tick box completing failhearts who prefer to stick with the tried and tested rather than investing in something new. Some hacks evidently thrive on such creatively restrictive parameters otherwise modern Dr Who would never get produced. But its no wonder to me that British tv no longer producers innovators of the calibre of Potter, Rosenthal, Clemens and Bird. Its now the norm for even moderately successful shows and formats to be sucked dry like coccooned bluebottles: Death in Paradise being a pertinent case in point. I must respectfully take exception to this. Despite several potentially disastrous changes over the years, DEATH IN PARADISE still manages to remain charming. Purely my opinion of course. I daresay if it wasn't being watched then it wouldn't be getting made. But I still maintain that there is an enormous Ben Miller shaped hole at the centre of it. But I still maintain that there is an enormous Ben Miller shaped hole at the centre of it. I think it improved when he left. There may well be subjective elements to this, of course. 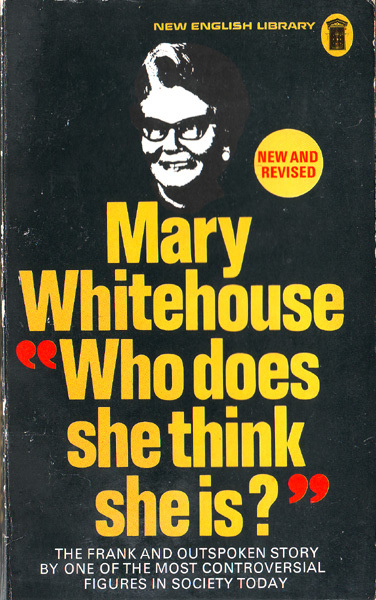 Only skimmed a few chapters before giving up but I did once go the distance with Max Caulfield's Mary Whitehouse (Mowbray,1976). I wonder what M.W. made of L.J? Do you suppose there's a commemorative photo some place? Dem - yes, that's the book. As far as I know there were no commemorative pictures of LJ and MW, though I'm seeing DJ in a couple of weeks so I'll ask him if he has any. I bet MW LOVED LJ, even if he was in his pink period - he could be a real charmer, and had a wonderful cultivated voice that had them turning weak at the knees - which was not bad for a boy from West Brom. Steve - I think the ads were for Allied carpets, in the late 70's when the career was in a bit of a lull. But being Tom, he still did a pro's job on 'em. Parodied himself in a Cadbury's chocolate ad at the end of his career, too. Great voice - did a hell of a lot of ad voice overs and along with Patrick Allen was one of the most recognisable voices on Brit TV for a while. He seemed to have the right persepective about his work - you do the toss and the stuff you're not keen on cos it pays the rent and lets you do the good stuff when it comes along. Jojo - I agree about Death In Paradise still having legs, but I put that down to the scenery for me, and the novelty (which still hasn't worn off) of putting a Columbo-type misfit character in a setting exotic for the form. CM - well, I don't agree about the mumbling when it comes to Gillian Anderson, but by God you're right about Duchovny. She's a pretty good actor, but he's a bit average, and shows poor choices in his work. She's done Dickens and The Fall - he did Californication... even mrs ph stopped watching that after a few episodes, and I'd wager she was the target audience. Saw some of the Red Shoe Diaries, too, which he did before the X Files - he turns up, sets the scene, then buggers off while the real story of soft core boredom carries on. He was so disinterested that I'm surprised he got the X Files gig after that. Playing opposite Anderson obviously made him up his game. That's shameful that they subtitled Lester - they never used to do that, and surely you could argue that's discriminatory? Although I wonder if it's really true that he claimed he just hadn't heard his accountant tell him he had to pay tax? I think the reason that drama series have longer lives now is not down to the loss of artistic preference and the desire to be innovative and move on, it's solely down to money. Have you noticed how even BBC produced shows have so many co-production credits now? The expansion of the TV market has this issue: there are an infinite number of channels, but a finite amount of cash to fill them (relatively speaking). If you make shows in longer seasons, you can sell them for strip programming (ie same slot Mon-Fri) on re-run, which is basically an extension of what syndication did in the US. You also have a better chance of getting ad revenue in those slots if the shows are familiar - so much choice that it becomes a maze, so people tend to go for what they know out of laziness/lack of time to check the guide/comfort viewing. That's why they like to flog a format to death. In the US, syndication requires 100 episodes or more - Fringe, of which I spoke yesterday, was flagging viewer wise in season 4, but the network comissioned a shorter (13 as opposed to 22 episodes) season 5 simply because it took the show beyond 100 episodes and enabled them to sell it in syndication. The problem doesn't really lie with producers - often, they are just doing what they are told in order to actually get any show made at all. For instance, I know of one documentary producer who had a raft of proposals that he took to the USA, only to be told that Discovery and History required a current angle on any shows, the past being anathema to viewers (this is the History channel, mark you)and so they were only comissioning shows that had a newsworthy new angle, or something that could be stripped on the side of a bus or on a billboard. There's your issue regarding innovation - networks with too many surveys and not enough gut instinct. Dem, that's hilarious that NEL did a book on Whitehouse. That screen of her face could be enlarged, cut out, and turned into a Halloween window thing to frighten small children. You know what they say the road to Hell is paved with. That and the road that leads to "this is why we can't have nice things." I think the reason that drama series have longer lives now is not down to the loss of artistic preference and the desire to be innovative and move on, it's solely down to money. Death in Paradise has lost a lot of its appeal thanks to its many cast changes, but it is still fun to watch. An antidote to all the grim and gritty. After a season of Broadchurch one wants counseling. I liked Californication, still I stopped watching it in later seasons. It has to be wearying to be "confrontational" all the time. Still, some great moments in it. Always nice supporting actresses. Still, I watched Duchovny in Aquarius, and boy, I just couldn't see him as a hard LA cop in the 60s. Maybe I have read to much Ellroy, but Duchovny just wasn't it. On the other hand, the whole concept didn't work well. X-Files was his best work, and even as a writer he wasn't bad. It is not his fault, that X-Files went years too long. Anderson is a much better actress, even if I thought The Fall was a bore. But I liked her on Hannibal. The avalanche of new shows has gotten ridiculous. I truly wonder when this bubble will burst. The investments involved are staggering, and it is hard to imagine that a lot of them will pay the money back. Oh aye, The Fall is pretentious balls, but it gives her a lot to work with as it's designed to be a real actor luvvie piece. At least Bleak House had a good script and story - and I don't even like Dickens! This is the problem - the democratisation of culture via technology also has the flipside that big business sees an opportunity and needs to get involved, often before it has a real grasp of what's going on. It's the music business all over again for TV and film.